Yesterday was Speedy's 3rd Birthday and for the first time in about 10 days Speedy was more like himself not 100% but definitely more like his normal self and to top it all he was starting to look for snacks whenever I put him in his pen or when I went in there till the moment I felt I should try him on his pellets I got his normal ones and grabbed a small handful and held in in front of him he ate about 6 pellets yay!I put some more in his bowl and this morning quite a few had gone he ate them through the night. He had his early morning cuddle and then I put him back he looked for a treat but only wanted a piece of papaya just a small bit so the meant some critical care and pumpkin this morning plus his meds.Then I got him some greens and he ate them too but still no more pellets.I have since mixed up his snacking hay and put some in with his pellets in his bowl down stairs today and yes he is eating it Yay! Currently he is in his litter tray munching on lots of hay and doing poops not the big raisin sized ones he would normally do but bigger and better than they have been. He is still not 100% fighting fit but he is getting there and that is the best birthday present I could wish for,for our Boy Speedy! Happy Birthday Speedy my boy! And keep on getting better Cheeky boy! 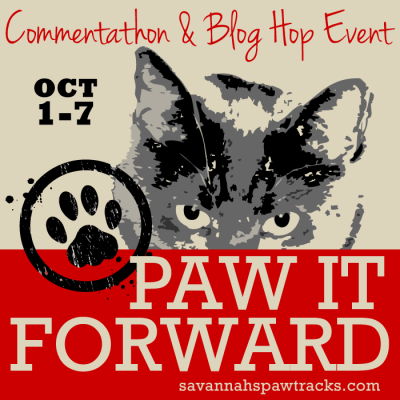 Please Hop on over to Savannah's as she still needs to reach her target for her commentathon and you only have today to get those last ones in! And lastly Thank you to Nellie for coming to visit me while she was in my neck of the woods helping out buddy Flynn who is also poorly. She really has the purfect touch to make you feel better,thanks Nellie you make the best Nurse! And thank you all for checking in on me and the POTP you have been sending Me! Dearest Rachel, I am so relieved to hear that Speedster made it through this. Still no word as to what it was? As long as he is recovering and being more like Speedy as we know him, it may have been a little "bug" like what most of us get from time to time. You are such a great care-giver to this little wonder we all love. I wish you and Speedy boy a fabulous WEEKEND! Whisper a little love message into his ear from Auntie Anita, OK? A very Happy Birthday to you Speedy. Hope you had a great day. 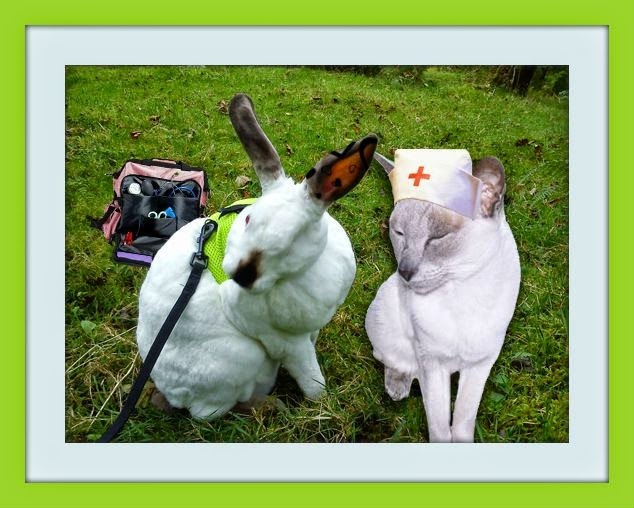 So glad to see Nurse Nellie there to help you feel better. Sending lots and lots of purrs. Happy Birthday to you Speedy and we are so pleased you are getting better and can enjoy your big day. Have a super Saturday. Happy Birthday, Speedy Boy! So very glad to hear that you are doing better. Keep in improving! Happy Birthday Speedy. Be a good boy and eat your hay and pellets. I know you would rather have birthday cake but it isn't good for a cranky bunny tummy. Happy birthday, Speedy! I'm so glad you are getting better, bit by bit! Sending lots of purrs your way! Happy Birthday Captain Speedy! It's great that you feel better today and you can celebrate with a small piece of papaya... bet you feel much better since Nellie came with her magic purrs, right? Happyyyyy birthday to you Speedy. It's nice to know that you are feeling better. I'm sure that in few days you will be 100% yourself. Happy Birthday Speedy! You are a special friend to so many of us and we are sure glad you are doing some better! Speedy, this is such good news to read! Keep eating! Happy birthday!!! That papaya sounds yummy. Happy Birthday Speedy! I am glad you are improving and starting to eat. Keep on improving. And I'm doing the hap-pee dance because you're feeling better! I'm late... I'M LATE.... MOUSES! HAPPY BIRTHDAY SPEEDY! May your YEAR be filled with love & cuddles and treats &.... carrots! CARROTS! Lots & lots of carrots, for sure. Happy 3rd Birthday Speedy, you keep getting better pal! I am so ashamed. I missed your birthday! Shame on me!!! Belated happy and blessed birthday, Speedy! Happy Belated Birthday, hope it was a terrific day!! 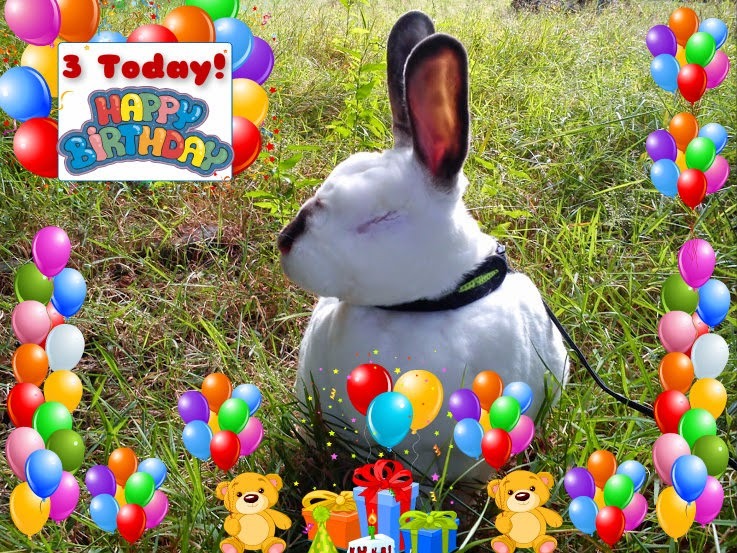 Happy and Hoppy Birthday Speedy :-) !!! Happy Belated Birthday Speedy! Mom has been busy and had the flu so she hasn't been keeping up with our friends I am sorry. So very very happy to hear that you are getting back to your self!!!!! We have been praying every night and sending your healing purrs and karma! This is the bestest birthday news ever! So glad he is doing better. Happy birthday sweet boy!